The attacks on the World Trade Center and the Pentagon on September 11, 2001 changed the way the world thinks about security. Everyday citizens learned how national security, international politics, and the economy are inextricably linked to business continuity and corporate security. Corporate leaders were reminded that the security of business, intellectual, and human assets has a tremendous impact on an organization's long-term viability. 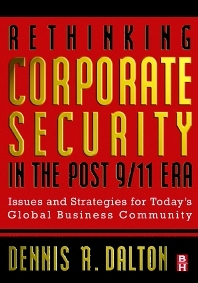 In Rethinking Corporate Security, Fortune 500 consultant Dennis Dalton helps security directors, CEOs, and business managers understand the fundamental role of security in today's business environment and outlines the steps to protect against corporate loss. He draws on the insights of such leaders as Jack Welch, Bill Gates, Charles Schwab, and Tom Peters in this unique review of security's evolving role and the development of a new management paradigm. 2) Who Should Take the Helm? 9) May I Play through? Dennis R. Dalton, Ph.D. Dr. Dalton holds degrees from Michigan State University and the University of Southern California. He is the owner of the management consulting firm Dalton Affiliates in Auburn, CA and is a nationally recognized security management consultant. A former security executive for 3 large multi-national firms, his clients are typically among the Fortune 500. As a strategic planner and specialist in organizational development, he assists his clients in redefining, restructuring, and building security programs consistent with the organization’s business aims. Author of more than 50 professional articles, Dr. Dalton is considered an industry spokesperson for the Wall Street Journal, San Francisco Examiner, Los Angeles Times, and several professional and trade publications. His professional accomplishments include Security Magazine’s Executive Management Achievement Award and several corporate and public service awards. He is a member of several professional associations and societies including the Board of Directors for the International Association of Professional Security Consultants. He is a frequent keynote speaker and seminar host.